The Prime Minister, Shri Narendra Modi launching the National Nutrition Mission, at a function, in Jhunjhunu, Rajasthan on March 08, 2018. The Union Minister for Women and Child Development, Smt. Maneka Sanjay Gandhi, the Chief Minister of Rajasthan, Smt. Vasundhara Raje and other dignitaries are also seen. 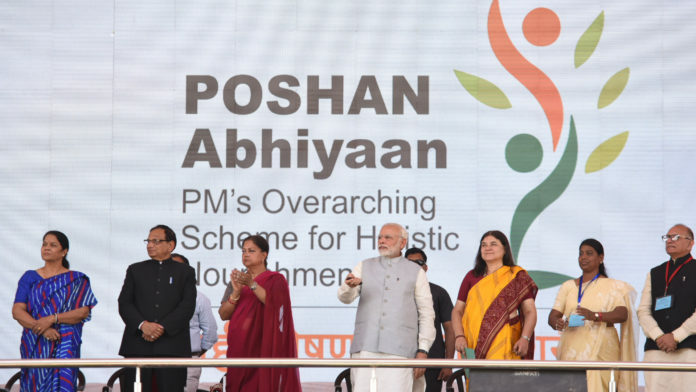 New Delhi: On the occasion of International Women’s Day today, the Prime Minister, Shri Narendra Modi, launched the National Nutrition Mission, and expansion of the coverage of Beti Bachao Beti Padhao programme, at Jhunjhunu in Rajasthan. The Prime Minister interacted with District Magistrates of aspirational districts. He also interacted with beneficiary mothers and girl children of the Beti Bachao Beti Padhao programme. The Prime Minister awarded certificates to the best performing districts under the Beti Bachao Beti Padhao programme. Speaking on the occasion, the Chief Minister of Rajasthan, Smt. VasundharaRaje, said that she is happy that the Prime Minister chose Rajasthan for the launch of a vital scheme and the expansion of another. Rajasthan will always support the efforts of the Prime Minister towards women empowerment, she added. Addressing the large gathering on the occasion, the Prime Minister said that through the power of technology, the entire nation is connected with Jhunjhunu. He appreciated Jhunjhunu district for furthering the Beti Bachao, Beti Padhao movement. He said there is no question of discrimination based on gender. 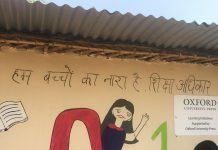 The Prime Minister stressed on the importance of girls getting access to quality education, just like boys. Emphasizing that a daughter is not a burden, he said girls are bringing pride and glory for our nation, and excelling in several fields. The Prime Minister also spoke of the importance of providing proper nutrition to children. He said Mission Indradhanush has brought an extremely positive change in the lives of women and children.